SEATTLE, Washington, April 29, 2013 (ENS) – If Bristol Bay, Alaska is opened to mining, the ore deposit would be mined for decades, and the wastes would require management “for centuries or even in perpetuity,” finds a revised environmental assessment issued Friday by the U.S. Environmental Protection Agency. 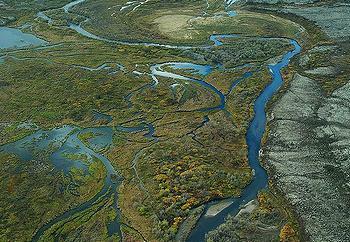 The Bristol Bay watershed in southwestern Alaska supports the largest sockeye salmon fishery in the world, is home to 25 federally recognized tribal governments, and also contains one of the largest concentrations of copper, gold and molybdenum in the world. The revised assessment, released for peer review follow-up and public comment, finds that hundreds of streams, creeks and rivers where salmon now run could be jeopardized if mining chemicals spill, if a pipeline carrying ore concentrate or diesel fuel is breached, if dams containing mine tailings break open, or even if culverts are blocked by debris. The Pebble Mine in Bristol Bay is proposed by the Pebble Partnership, based in Anchorage, Alaska, a joint venture between the British company, Anglo American, and the Canadian company, Northern Dynasty Minerals. The revised assessment is intended to provide a baseline for understanding the impacts of mine development not just at the Pebble deposit, but throughout the Nushagak and Kvichak River watersheds. “This is not an in-depth assessment of a specific mine, but rather an examination of impacts of reasonably foreseeable mining activities in the Bristol Bay region,” says the EPA. The Bristol Bay watershed is inhabited by 29 fish species, more than 40 terrestrial mammals, and more than 190 species of birds. The watershed supports production of all five species of Pacific salmon found in North America: sockeye, coho, Chinook, chum, and pink. Because no hatchery fish are raised or released in the watershed, Bristol Bay’s salmon populations are entirely wild. These fishes are anadromous, meaning that they hatch and rear in freshwater systems, migrate to sea to grow to adult size, and return to freshwater systems to spawn and die. 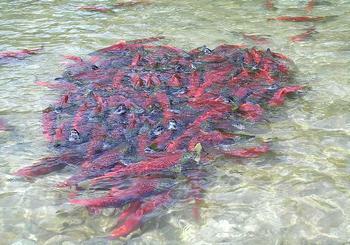 The watershed supports some 46 percent of the average global abundance of wild sockeye salmon. “Between 1990 and 2009, the annual average inshore run of sockeye salmon in Bristol Bay was approximately 37.5 million fish. Annual commercial harvest of sockeye over this same period averaged 25.7 million fish. 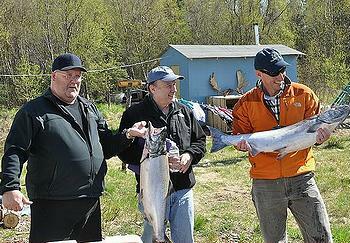 Approximately half of the Bristol Bay sockeye salmon production is from the Nushagak and Kvichak River watersheds, the main area of focus for this assessment,” the EPA states. “Surface and subsurface waters are highly connected, enabling hydrologic and biochemical connectivity between wetlands, ponds, streams, and rivers, thus increasing the diversity and stability of habitats able to support fish,” the agency states. Some Alaska Native villages in the watershed have decided that large-scale hard rock mining is not for them, while a few others are seriously considering this opportunity. The three mine scenarios evaluated in the assessment are based on the amount of ore processed: Pebble 0.25 (approximately 0.25 billion tons of ore and duration of 20 years), Pebble 2.0 (approximately 2.0 billion tons of ore and duration of 25 years), and Pebble 6.5 (approximately 6.5 billion tons of ore and duration of 78 years). The mine scenarios include an 86-mile transportation corridor of which 70 miles would be within the assessment watersheds. This corridor would include a gravel-surfaced road and four pipelines – one each for product concentrate, return water, diesel fuel, and natural gas. The assessment considers what would happen in the event of failures of a tailings dam, pipelines, a wastewater treatment plant, and culverts. Just building and operating the largest of the three scenarios assessed would result in the loss of 90 miles of streams in the footprint of the mine pit, tailings storage facilities and waste rock piles, due to elimination, blockage, or dewatering of streams, in addition to loss of 4,800 acres of wetland habitat. What is not assessed is as important as what is covered in the report. Although scenarios for large-scale mining in the Bristol Bay watershed assume development of a deep-water port on Cook Inlet to ship product concentrate elsewhere for smelting and refining, impacts of port development and operation are not assessed. The assessment does not evaluate impacts of the one or more large power plants that would be required to power the mine and the port. It does not assess the effects of induced development that could result from large-scale mining in the region although the report recognizes that mine development would mean construction of support services for mine employees and their families, recreational facilities, vacation homes, and transportation infrastructure beyond the main corridor, including airports, docks, and roads. “You simply cannot assess the effects of a mining project that has not been proposed, and for which key engineering solutions, environmental safeguards and site-specific mitigation factors have not been provided,” said Ron Thiessen, president and CEO of Northern Dynasty, a 50 percent owner of the Pebble Limited Partnership with Anglo American. Blair fears that if the Pebble Mine development is permitted it would open the area to even more mines. Public comment on the revised assessment is welcome through May 31. After this peer review follow-up and public comment period are complete, EPA will review feedback and finalize the assessment later this year.